Summer 2010, "Cleveland Rocks." The big feature this time focuses on the current Springsteen exhibit at the Rock and Roll Hall of Fame, with 16 pages devoted to "From Asbury Park to the Promised Land: The Life and Music of Bruce Springsteen." We take you through the exhibit from floor to floor, picturing many of the artifacts and documenting Bruce's handwritten notes along the way. Then, we've got the full text of curator Jim Henke's interview with Springsteen himself about what's on display. Portions of this interview can be heard at listening stations throughout the exhibit; Backstreets is the only place you'll find the whole thing. 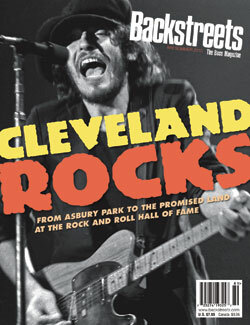 The Cleveland theme continues as WMMS program director John Gorman writes about Springsteen's rise in the region, culminating with the '78 Agora broadcast, in this excerpt from his book The Buzzard: Inside the Glory Days of WMMS and Cleveland Rock Radio. Plus: The Backstreets Interview with Bruce's latest collaborator, Alejandro Escovedo; 2010 performances so far, including Dave Marsh on The Rascals and John Wesley Harding on WAMfest; Bruce's Ellis Island Foundation honor (including his full speech); David Masciotra's Working on a Dream: The Progressive Political Vision of Bruce Springsteen in review; we say goodbye to Bruce Springsteen Band vocalist Delores "Dee Holmes; reviews of the latest CD-Rs and Bruce boots, and more.